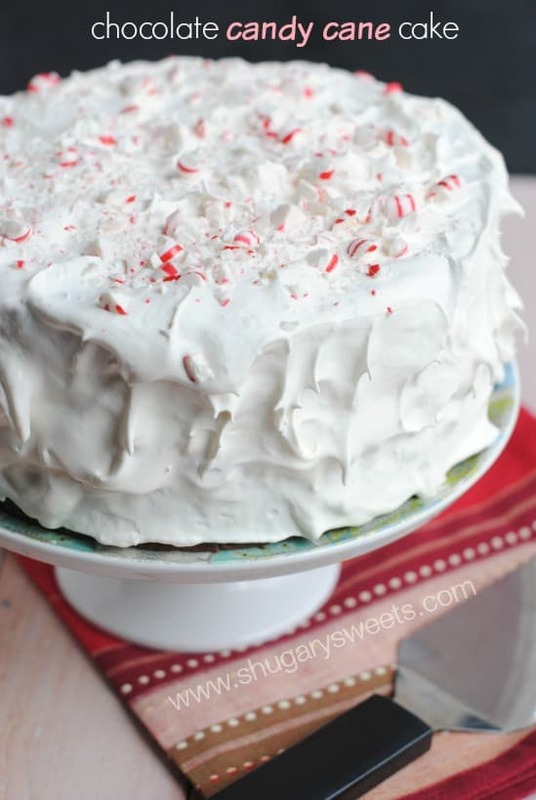 Chocolate Candy Cane Cake: it’s the dessert your family wants you to bring to the holiday get together this year! Trust me!! Okay. Confession time. When my kids were little I hated having them help in the kitchen. I mean seriously, I love my kids, but baking a batch of cookies would take about ten times as long. And don’t hate me for this okay. Cause I don’t know too many people who LIKE bringing their kids to work. And cooking and baking in the kitchen, it’s my job. It’s a fun job, don’t get me wrong, but the kitchen is my office. Fast forward a couple years and suddenly I’m all about having assistants. I can be writing a blog post and editing pictures on my laptop while putting my kids to work, baking and cooking. Teaching them young paid off in the end. They know how to read recipes, crack eggs, and use the stove top. Most of the time. It’s especially helpful when mom has a migraine and deadlines. I knew I wanted to bake….but I also knew my migraine was keeping me 10 feet from all food due to nausea. Fortunately my youngest LOVES to help out! And guess what? 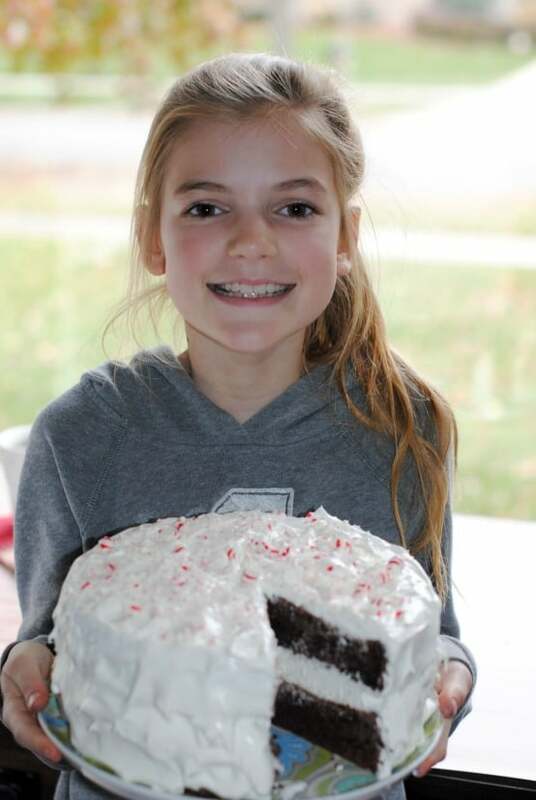 This cake is so easy, even a ten year old can make it (you may have seen this photo on instagram…do you follow me yet??). I started with a box mix, and then grabbed some of my favorite ingredients from my pantry and refrigerator. And by “I grabbed” I totally mean my daughter did. Because I sat in a chair on the island, supervising. To the chocolate cake mix, you’ll want to add a box of JELL-O Chocolate Instant Pudding mix (wow does this add some moisture to the cake!! ), as well as your eggs, oil, water, milk and some sour cream. No one is going to believe this cake started from a mix. I also put my daughter to work pounding out 18 small candy canes. This is where our first “happy error” came about. The original recipe called for about 1 cup crushed candy canes, divided. Whoops…that ALL went into our batter! And our cake never tasted so good. Seriously. It was minty and delicious, and I’m writing the recipe just as she made it. That’s why we call it a Happy Error! She also chopped up some semi-sweet chocolate and added that to the cake batter. What a wonderful surprise to the cake. It’s like chocolate chips, but bigger chunks. The sweet peppermint, the moist and rich chocolate cake, and the surprise crunches of chocolate…this is seriously one splendid dessert. Bake the cake 35-40 minutes and allow to cool in pans 5 minutes. 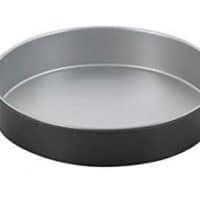 Loosen cakes from sides of pans and invert onto wire racks. Cool COMPLETELY before frosting. We chilled our cake layers in the refrigerator for about an hour. Once we chilled our layers of cake, my daughter made a quick chocolate ganache by using another bar of Semi-Sweet Chocolate and 1/2 cup of heavy cream. This was spread over the bottom layer of cake. We also doubled the amount of COOL WHIP in this recipe. First, who doesn’t love extra COOL WHIP? Second, we wanted a nice thick layer in the center of the cake, without being skimpy on the sides. She also then crushed up a few extra candy canes for garnish. 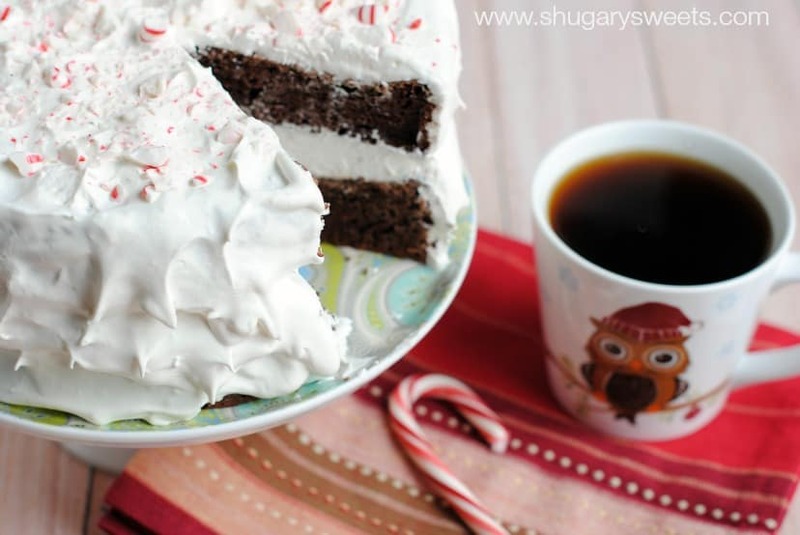 The best part of this Chocolate Peppermint Cake recipe? You can make it ahead of time! We made ours the day before serving and stored it in the refrigerator. Such a cool, refreshing treat after dinner. This one is sure to please this holiday season. Take your love of chocolate peppermint cakes to a new level. 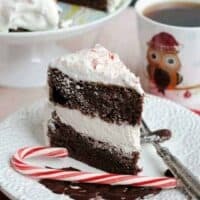 This Christmas favorite is a Chocolate Peppermint Cheesecake Cake and is layered with rich chocolate cake, peppermint cheesecake, and peppermint frosting! I’m obsessed with making these cheesecake cakes. And it was only necessary to make an eggnog version. With a homemade spice cake. And eggnog buttercream frosting. 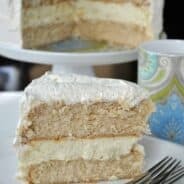 This Eggnog Cheesecake Cake is a true Christmas treat! Have a little fun this Christmas and make an entrance at your next holiday party with this easy Ugly Sweater Cake! Don’t forget the fudge! This Candy Cane Fudge recipe is packed with peppermint and creamy vanilla fudge flavor. 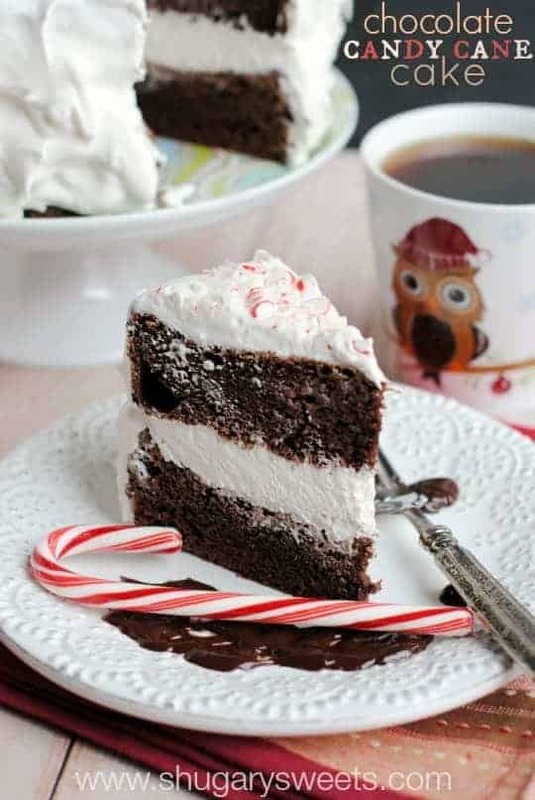 Chocolate Candy Cane Cake: it's the dessert your family wants you to bring to the holiday get together this year! Trust me!! Lining the bottom of the cake pans with parchment paper is optional. But with the full cup of candy canes crushed into the batter, some parts may be sticky. This helps it remove from the pan easily! She definitely loves helping out!! looks AMAZING! I wish I had a piece of this cake and big ol glass of milk right now. And this cake, wow! Every season you seem to make one of these types of cake. Your pumpkin one, your eggnog one from last winter, and I love them all! They are just so signature you! That filling. I want to live in that 🙂 Pinned! I had a migraine yesterday, Aimee, and was so nauseous too! Man, I feel your pain. You can’t eat or move, much less bake. Well, my kids are too young to do anything but mess up the house, but I someday hope that at least one of them will be as handy as your daughter! She did you proud. Great cake! Hope you’re feeling better Mir! yeah, she did me proud 🙂 She’s a great helper! Love that sweet face on your little helper! And yeah for happy accidents! This cake looks delicious! Wow this cake sounds amazing! I absolutely love chocolate and peppermint together. This cake looks amazing Aimee! Your daughter did such a wonderful job I would have never known!! Yay for kids getting older and being able to really help! She did a great job! This cake would be the perfect show stopper for Christmas! LOVE the creamy frosting! Pinned! The perfect Christmas dessert. Your daughter nailed it! The most decadent and delicious happy error I’ve ever seen! I wrote a post a while back where I talked about my kids in the kitchen. How I need to let go and let them help because those will be lasting memories for them that they can eventually pass to their kids! I am SO loving this cake that your daughter made! It’s so hard, because it’s our work too. I was so much more relaxed about letting them help before I became a blogger. Oh my goodness this cake looks so good! That frosting…I want to dive right in. Looks so fluffy and delicious!! I love love love chocolate and peppermint, I wish it was a thing all year long and not just at the holidays! This cake looks so delicious! Your helper is adorable and the cake looks fabulous! You have yourself a fabulous assistant Aimee! She could take over the business one day. She did a remarkable job! I was the same way with my kids when they were little, it was always more trouble having them help. Now, My daughter makes dinner. It did pay off. So sweet that you have a little cook to help you out when you’re under the weather! Hope the migraine goes away quickly, Aimee! 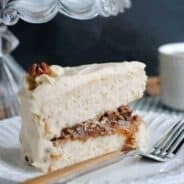 This cake is totally gorgeous and I can’t believe it’s so simple to make! I was the same way when my kids were little…it was just so much easier to do it myself. But I am glad that I had them help me then because they still love helping now. You cute little helper did an amazing job on that cake! It is gorgeous and I love all the happy errors and additions. Perfect holiday cake! That looks seriously amazing and I am in love with the thick middle layer!! We didn’t go overboard at all, right?? Your daughter did an amazing job! This cake looks incredible! May I borrow your daughter for a day?? I could totally use a baking assistant! My guy offered to help one time, but… Well, let’s just say I redid that entire recipe. 😉 And hooray for happy mistakes!! Pinned! 2-I love that your daughter made this! So sweet! Do you think that this cake would work using something besides the Cool Whip? I’m not sure that real whipping cream would hold up very long, even with the addition of a bit of instant vanilla pudding. (Great trick, by the way!) I also thought about using vanilla buttercream, but I’m concerned that it might be over the top sweet. Any ideas? Just not a fan of Cool Whip. Vanilla buttercream would be good, but yes, very sweet. You can also buy Dream Whip (in the Jell-O aisle) and make that as your topping. I made this tonight! I am taking it to my ugly sweater party tomorrow…. It sure isn’t as pretty as your 10 yr olds!! 🙂 Hopefully it’ll taste alright. I think I needed to pound the candy canes more, but, at least it’ll be a lesson learned!!! Thanks so much for this! I made this cake for a dinner party that I attended (Turkey was the main course) and it was a big hit! I have never made ganache before, I was a little alarmed that I was essentially putting hot liquid onto the bottom layer when assembling. All turned out of course, and that step made the cake even more wonderful. Refrigerating food made with candy canes does seem to create a little bit of a stickier mess. Did you sprinkle the candy canes on the Cool Whip and then refrigerate? I would wait (next time :)) to sprinkle candy canes immediately before serving! Hope that helps (glad you still enjoyed the cake)! I made this cake for Christmas. It was so easy, so pretty and delicious! Everyone loved it. Someone said it was the best thing they had ever eaten! Thank you for sharing your lovely recipe! Thank you for such a sweet comment 🙂 Merry Christmas! Oh wow! That cake is beyond amazing. The chocolate lover in me is itching to make it. I definitely will. Thanks for your recipe and wait a new your post!! I am so excited to try this cake. Love peppermint and chocolate. However, not a fan of Cool Whip. Do you have any suggestions for different topping? Maybe chocolate or vanilla buttercream? 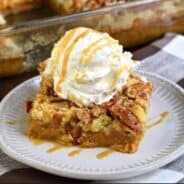 Thank you for sharing this yummy recipe.